Hosted by the Sibley Music Library of the Eastman School of Music Rochester, NY USA. The IHS Archive is a repository for documents and memorabilia exclusively related to the history and development of the IHS. It is located at the Eastman School of Music. 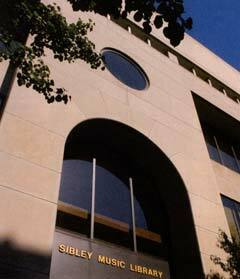 The Sibley Music Library, serving the Eastman School of Music and the University of Rochester, is the largest music library affiliated with any college or university in the United States, with total resources of over a half-million items. As such, the Library offers vast resources for performance and historical research. The IHS Archive Collection housed at the Sibley Music Library consists of documentation pertaining to the IHS itself (records, publications, membership directories, and photographs) and special donated material. The IHS Archive and the IHS Thesis Lending Library can be useful to researchers seeking resource material. In the IHS Archive there is some other material for several possible topics: biographical studies of Max Pottag, Carl Geyer, Wendell Hoss, Barry Tuckwell, Alfred Brain, and American hornists since 1920; a comprehensive history of the society; collecting valuable information from taped lectures and narratives by Willem Valkeneir, Wendell Hoss and Max Hess; and the translation into English of numerous articles and letters. The Archive is not open to the general public. Researchers will need to contact an Eastman librarian or Prof. Peter Kurau to arrange an appointment. See The Horn Call Vol. XV, Number 2 for more information.